Just how aware of soundbites should reviewers be? It is slightly ironic that a show about prison could land it’s Producers in one, but it seems that the Westminster Trading Standards Office are out prima donna-ring the best of us and threatening them with such. Indeed looking at the enormous whirlwind of bureaucratic dust that has been blown up over the alleged misquoting of Charles Spencer, no one could say the West End wasn’t fabulously over-the-top. But whilst it’s been funny to watch the WTSO up in arms like mini Mary Whitehouses; “It is not acceptable for any theatre to mislead the public” they say rather officiously (I mean steady on there deary) it’s also a bit worrying. As Spencer himself points out, this hoo hah is in danger of being used to set a dreaded ‘example’, an example which could end up (after long tedious legal battles) in reviews which are so blandly non-committal as to be worthless. Even if ‘Shawshankgate’ doesn’t lead to such a disheartening conclusion, it raises the question of just how aware (and responsible?) reviewers should be of possible soundbites. With friends on both sides of the fence, I know how expected it is to include snappy sentences that can be used on advertising material, although obviously only if the review is good. It does seem a bit foolish of Spencer to include such a quotable line of praise in the middle of a mediocre write up; he’s been doing it long enough to know someone was bound to pinch it . Surely you should be able to write what you want but in the light of the over-the-top reaction to the current Shawshank debacle, should we all be keeping one eye on the possible manipulations of desperate marketing men? They couldn’t use it if we didn’t put it out there. 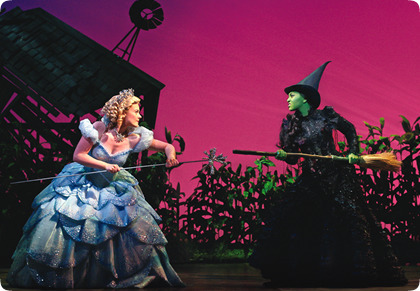 In the crazy dance of promotion and critic, aren’t we both a little bit responsible? There is something terribly beautiful about the rawness of Michael Twaits’ work and something rather spiritual about it too. He’s not afraid to reveal all to his audience, offering himself up completely on an alter to the gods. It is therefore fitting that in his new show Twaits takes us through an exploration of our new holy of holies; celebrities. Icons is a caustic multi-media cabaret that is as far away from the calm religious portraits of the past as Jesus is from Jade Goody. But maybe these two figures are closer than we like to think; as Twaits rather eerily puts it, “If Heat is the celebrity Bible, Jade Goody is its parable”. It’s this mixture of wit and scary insight that makes Icons more than just a pithy piece of celebrity fun. Twaits is out to find the meaning of our modern icons and he does so using both sparkly schadenfreude and a disturbing amount of common sense. We are introduced to Lucky, a Britney Spears fan who is trying to transcend herself and literally become Britney (if she could eat her body and drink her blood you genuinely feel she would), a hesitant yet defiant Garry Glitter obsessive and of course the fabulous Lady M, Twaits’ infamous drag alter ego. Whirling through a blend of video footage, Q&A sessions, monologues and songs, we’re plunged into their obsessions, seeing them in all their desperate neediness and vulnerability. At points it’s a bit of a messy journey, with not all the sequences totally working, but holistically Icons packs a punch. For although Twaits’ vicious wit is out in force, so is his empathy, and through our laughter we feel for these star worshippers. Because in the midst of all this glitter and gold it’s the sad realisation that our icons have fallen from their celestial posts that hits you the hardest. In the face of their fall where does this leave us mere mortals? Twaits’ greatest skill is the ability to marry the frivolous with the serious and in the midst of all this fluff to make you think. The defining number of the night comes as Lady M heart-stoppingly sings “Stonewall”, Twaits’ joyously defiant song. In this moment, as Judy Garland inspires a group of individuals to change the course of their lives, you are transcended from the mundane to the sublime and surely whether religious or famous, that’s the purpose of a modern icon. At St George’s Circus there is a performance going on in the midst of an atmospheric building with a fading grandeur and massive holes in the floor. Lit only by lights wired to a generator, candles and torches, the members of the South London Free Arts Collective (SLFAC) are performing the quirky and uplifting story of Brass Crosby. 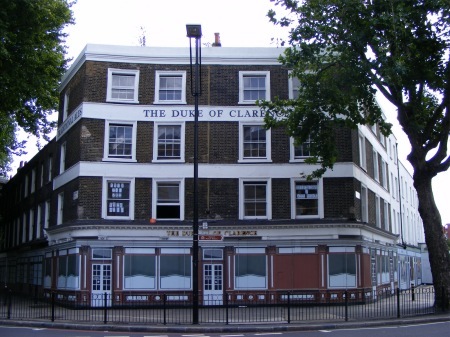 We are in the middle of what is ungraciously called a condemned building, but what could easily be one of the most interesting site specific venues in London; The Duke of Clarence.